Boats are docked at the Nihonbashi fish market in Tokyo. During the early Edo Period (1603-1868) Shogun Tokugawa Ieyasu invited fishermen from Tsukudajima in Osaka to Edo to provide fish for the castle. 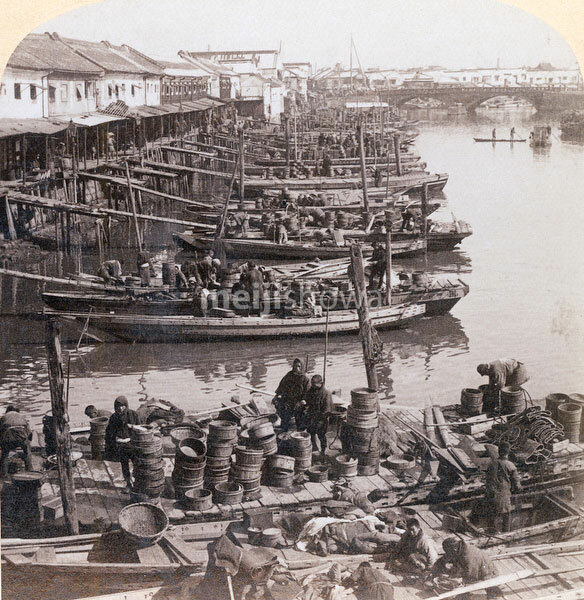 These fishermen started a specialized wholesale market called Uogashi (fish quay) in Nihonbashi. After the Nihonbashi fish-market was destroyed in the Great Kanto Earthquake of September 1, 1923 (Taisho 12), it was relocated to the Tsukiji district, where it still operates to this day.